Aravindan Krishnamurthy from Pondicherry, B.E. - B.Tech Graduate. SYSTEM & NETWORK ENG.. SECURITY SYSTEMS SECURITY & ADMINISTR.. HARADWARE ASSEMBLING.. IT & ADMINISTRATION ..
are one of expert skill area's of Aravindan Krishnamurthy . 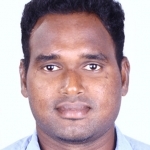 Aravindan Krishnamurthy is working in IT Software industry.